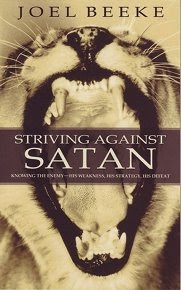 stylos: Beeke's "Striving Against Satan"
Some of our JPBC women are doing a Saturday morning study of Joel Beeke's little book, Striving Against Satan. Beeke's book avoids the extremes of some charimatics, on one hand, who tend to overemphasize or distort the Biblical perspective on spiritual warfare and liberals, on the other hand, who do not believe in the reality of Satan. You can listen to an interview with Beeke about the book on CrossTalk radio here.